Bitter~Sweet ™: Why write about diabetes? I’m feeling quite under the weather today (thank you Pete, for sharing the bad cold you caught while I was away last week). And this topic is not an easy one for me to try to explain. Basically, I write about diabetes because I feel driven to - and here is a rambly 15 minutes to try to explain why . . .
Back when I first found the DOC, I was a knit-blogger. The second I found people out there living with diabetes, just like me, and BLOGGING about it too, I knew I wanted to be a part of it all. I wanted to leave comments and connect, but I thought linking my knitting blog in the comments would be weird. So to avoid having people think “Who is this crazy knitting girl who leaves comments on diabetes blogs?”, I decided to start Bitter-Sweet. 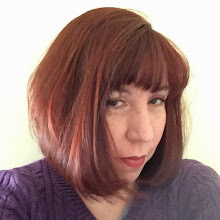 Of course, now that I know the DOC, I know people would have been happy to connect, no matter what my blog was - or even if I had no blog at all. 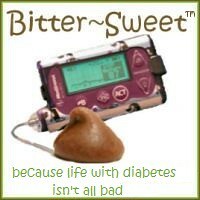 But in the long run, I'm grateful for the motivation to start blogging about diabetes. Once I started sharing my diabetes life, I found I had a lot to say. I started to meet other diabetes bloggers in person, and I started to build some very important friendships. I started out looking to connect with people who understood how living with diabetes felt. I never imagined the connections would turn into such strong friendships - the kind where you can spend well over two hours on the phone with someone and still have a ton left to say. This is still the main reason I blog, this is the root of my passion. However, writing about diabetes has evolved to more than that for me. I want to help, I want to advocate for the changes we need, I want to make a difference. I am just one little voice, but I’ve seen our community band our “little voices” together to send loud, clear messages. It’s exciting to advocate for something I believe deeply in, and it is a path I never imagined my blog would lead me to. You are right about the connections with PWDs. It is impossible to explain to someone that isn't a PWD. As far as Pete sharing his cold, you should be glad he isn't selfish! I hope you feel better soon. I could not agree more!!! I started my blog just last month and it has truly been life changing. I only started it to just let out my feelings, etc. Not really expecting or knowing if anyone would actually READ it. It's started to take on a life of its own and I am learning more about myself now than I have in the last 19 years of being a PWD. Love the pictures -- hope to be able to meet more from the DOC soon!